My new Inspiron 7559 wont detect my LG monitor and I cant figure out why so would appreciate any advice that can be offered. Dell Laptop works fine apart from this issue. Dell Laptop with same HDMI to my 32" lcd tv works fine as second monitor. This hopefully rules out a hardware fault. The HDMI on the dell laptop works to a tv, the hdmi lead works and the monitor works with another source input. For some reason the dell laptop will not detect the monitor. I can't try another output as the laptop only has hdmi out. Have tried deleting drivers and rebooting with basic drivers but no luck. Monitor is a LG m228wd - have contacted LG and they say the problem lies with the laptop. Did u get it resolved? I am facing the same issue!!! Just bought the dell laptop last week. No I've never had any response and haven't been able to get anyone to help. It's really frustrating. 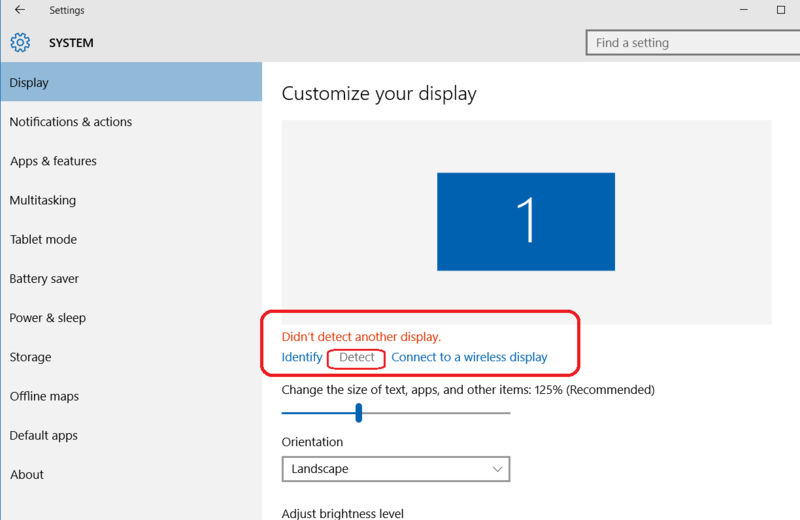 Open Display settings by right clicking on desktop and select the external monitor. TVs usually can be discovered immediately, but ext monitors need to be setup manually. This is Windows 10. So, I did a right click on the background to bring up the display setting. I pressed "Detect" but it returned with no detection!!! I am wondering if the laptop doesn't like the HDMI-to-DVI adapter!!! Too bad I don't have a HDMI monitor to test this out! My older laptop (with vga & hdmi) is ok to display via hdmi-to-dvi adapter to that same monitor! Did you ever make any progress with this? My Dell Inspiron 7559 just started doing the same thing. I replaced another HDMI cable and that resolved the problem!!! Don't know why the 1st cable doesn't work with the monitor!! !